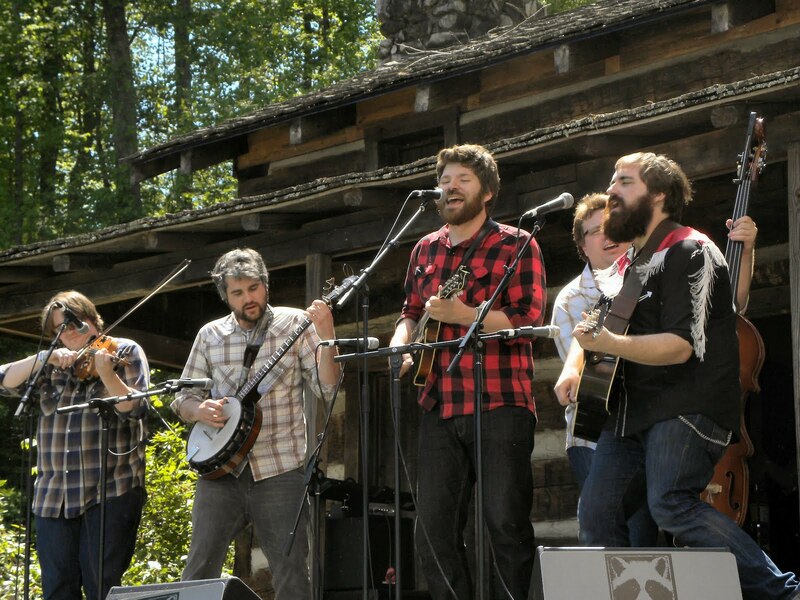 For those of us living in northern Virginia, we have the unique opportunity Saturday (July 31st) to enjoy fine wine while listening to one of the most explosive bluegrass bands around. Cadillac Sky is playing at Tarara Winery's Summer Concert Series and this is one show you shouldn't miss. 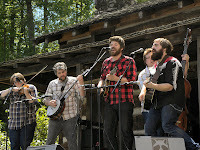 Some have described the band as the next Avett Brothers and they were a huge hit at this year's Merlefest. A ticket is only $15, children 7 and under are free, and there will be plenty of wines available. In fact, Tarara's wines have become very impressive under the direction of winemaker Jordan Harris. We will see you there. Since we were camping at this year's FloydFest - actually sleeping in my car - and didn't have to drive an hour to a hotel room - there was greater freedom to indulge in the various wine and beer offered. We consumed more beer than wine, just the nature of an outdoor music festival. 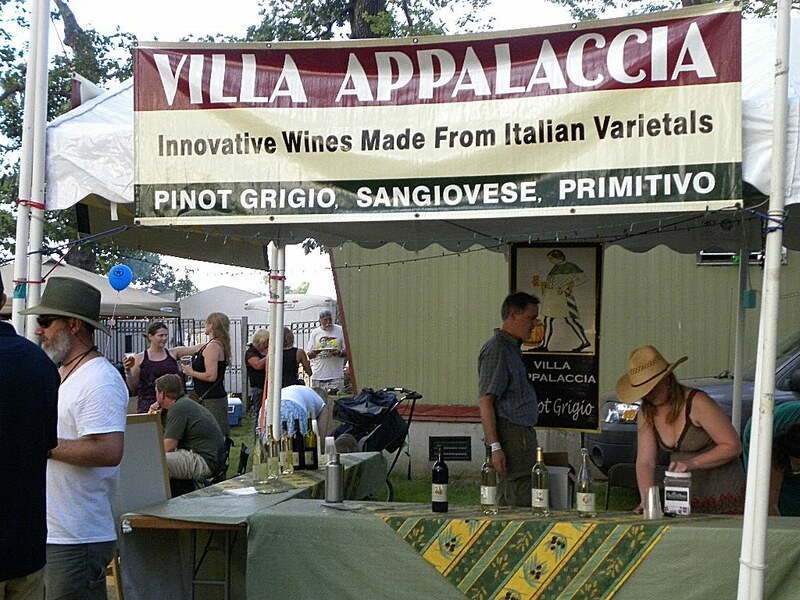 Two neighboring wineries were pouring, Villa Appalaccia Winery and Chateau Morrisette. Actually, the two are very active participants, with Villa Appalaccia located within walking distance and Chateau Morrisette offering its concert field for parking. 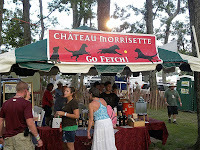 The most popular wines seemed to be Chateau Morrisette's white and red sangria. Whenever we visited their station, representatives couldn't keep up with demand. I liked the white sangria - it had just enough touch of lemon to sooth a thirst. I only tries one of Villa Appalaccia's wines, their Simpatico - pairing with a spicy burrito dinner. But beer was on the agenda, with three breweries taking most of our action. Crozet's Starr Hill Brewing was the easiest to reach, being situated adjacent to the Garden stage. Its also nice that they were pouring two of our favorites, the Jomo Lager and Pale Ale. The lager satisfies a thirst with a nice balance between malt and hops, whereas the pale ale is much stronger and pairs beautifully while listening to music. Slow drinking. 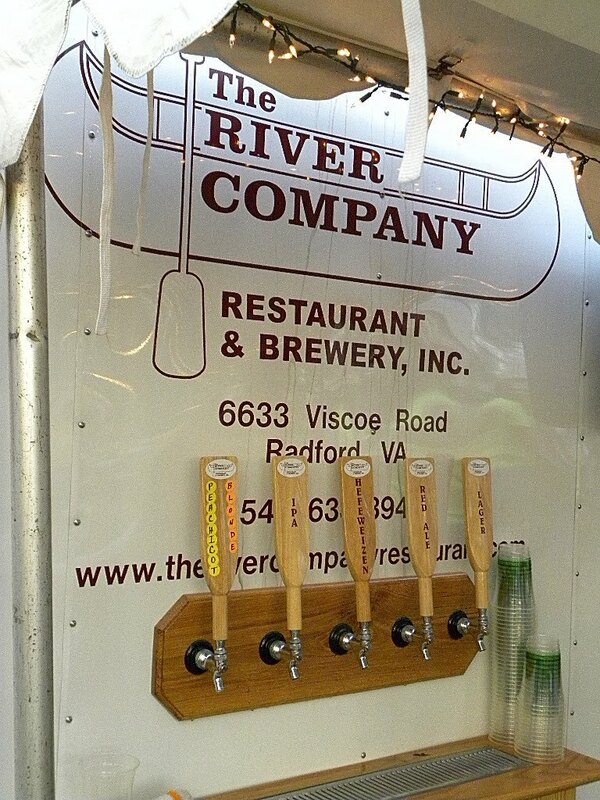 Another brewery we attended frequently was The River Company Restaurant and Brewery, out of Radford. They were conveniently located at the entrance to the Beer Garden but served two completely different beers (among others) that kept us coming back. Farmhouse Hefeweizen was a refreshing hefe, with the traditional sweet wheat flavor and a smooth balanced tail. This was nice. For something completely different we drank their Dumpster Dog Porter, made from seven different types of malt. This is a big beer, with bits of the chocolate flavor associated with our favorite porters. The beer finished strong as well - a nice ride from start to finish. The final brewery in the Beer Garden that we frequented often was Foothills Brewing, from Winston Salem. We first "discovered" this brewery at last year's Floydfest and each year come to appreciate their offerings even more. Foothills beers tend to be a tad hoppier than competing brands and even their lightest, Torch Pilsner, had a little more hops than more traditional pilsners. That doesn't mean the beers are bitter, they just exude different characteristics - perhaps a little more spiciness. 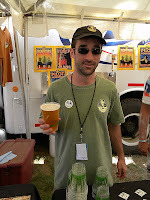 The Torch Pilsner is your everyday festival beer - smooth and refreshing, and at one point my favorite of their offerings. Their Pilot Mountain Pale Ale is stronger, with two other IPA's rounding out the first day's selections. The IPA's are both hop monsters, more suited to consume with food as they cleanse the palate quickly. But the greatest treat came when brewmaster Jamie Bartholomaus rode up with a keg of Sexual Chocolate, an Imperial Stout, that's the bomb. This beer is strong, creamy; but smooth and drinkable. Not afraid of drinking dark beers during the day, we consumed several of these - it was a hit. By Saturday night we had discovered the VIP tent, with some beers found in the Beer Garden but a completely new collection from a home brewer from the area. 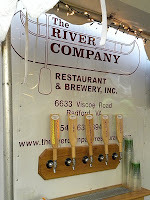 I never made it back to meet the brewer, but his beers were quite good - particularly the Pilsner and Black Lager. Next year I'll have to spend more time in the VIP tent learning more about this mystery brewer. This is a busy week at MyJoog.com starting with a short trip to Wolf Trap Wednesday night, the Steep Canyon Rangers Thursday, and then off to Floydfest for the weekend festival. The Wolf Trap show features John Hiatt opening for the Levon Helm Band. Not only is this a great combo in itself, but the great Jim Weider is playing in Helm's band. Awesome. The following evening is family night - with us making the short drive to Frying Pan Park to see a free show from the Steep Canyon Rangers. What a treat. Finally we pack up the camping gear and follow Levon Helm southwest to Floydfest for two-three days (depending when we arrive Friday) of excellent music. Some of the acts we are looking forward to hearing, in addition to Helm, are The Hackensaw Boys, OCMS, Bearfoot, Mountain Heart, JJ Grey & Mofro, American Aquarium, Joe Pug, Railroad Earth, and Cornmeal, among many others. 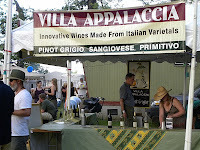 Plus, not having the family will allow a little more indulgence in the beer garden with wine and beer from Chateau Morrisette, Starr Hill Brewing, Foothills Brewing, The River Company Restaurant and Brewery, and Villa Appalaccia Winery. See you on The Crooked Road. Is Bio-dynamic Grape Growing a Hoax? I recently read an interesting article by Dr. Mark Greenspan in the Wine Business Monthly titled, "Thoughts on Organic, Bio-dynamic, and Sustainable Grape Growing". This article is a reasonable critique of the Bio-dynamic movement particularly with the true believers who infer that conventional wine is bad, organic wine is better, and bio-dynamic wine is best. Dr. Greenspan also critiques many bio-dynamic practices because they can not be tested in a scientific manner. This article forced me to research the subject a little more which led me to a site which wasn't pulling punches, "Biodynamics is a Hoax". Published by Stu Smith, of Smith-Madrone Vineyard, this blog is dedicated to proving that Biodynamics founder, Rudolf Steiner, was a "nutcase" and fraud and that Biodynamics farming may do more harm in the long run. Very interesting propositions. While traveling north along I-95 in Georgia we searched Wine-Compass.com for a winery adjacent to the highway and found a candidate just north of the border in South Carolina. 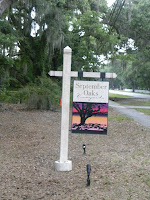 In fact, September Oaks Vineyards is situated only a few miles off I-95 in Ridgeland, South Carolina. The winery is owned and operated by Grady Woods (and his family), who started the venture as a side project from his typical vocation as an architect. They planted the vines two years ago in a field surrounded by oak and pecan trees draped with Spanish Moss. A true southern property. And in typical southern fashion the grapes are various muscadine varieties that excel in the hot and humid climate. In addition they planted Carnelian, a hybrid "created by the University of California in 1972 in order to create a grape for hot climates which still possessed some of the characteristics of the Cabernet Sauvignon grape. It is a hybrid "created by the University of California in 1972 in order to create a grape for hot climates which still possessed some of the characteristics of the Cabernet Sauvignon grape. It is a cross between the Carignane and the Cabernet Sauvignon that was then further crossed with the Grenache." While this fruit matures they source fruit from north and south Georgia. Now, some Drink Local zealots may frown upon this decision, since the grapes are grown out of state, but considering that September Oaks Vineyards lies so close to the Georgia border - it is no difference than a Virginian or New York winery sourcing grapes from across the state. 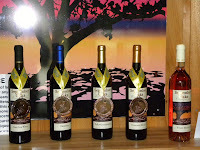 In order to accommodate the tastes of the local population, the wines are crafted from off-dry to sweet; however none of the wines were sickly sweet or gritty. We started with the driest, a White Merlot where the juice lies with the skins just long enough to gain color. This wine is also used in the Family Reserve Red Wine which is also blended with muscadine. Both of these are nice wines - not completely dry but tailored for an audience moving in that direction. 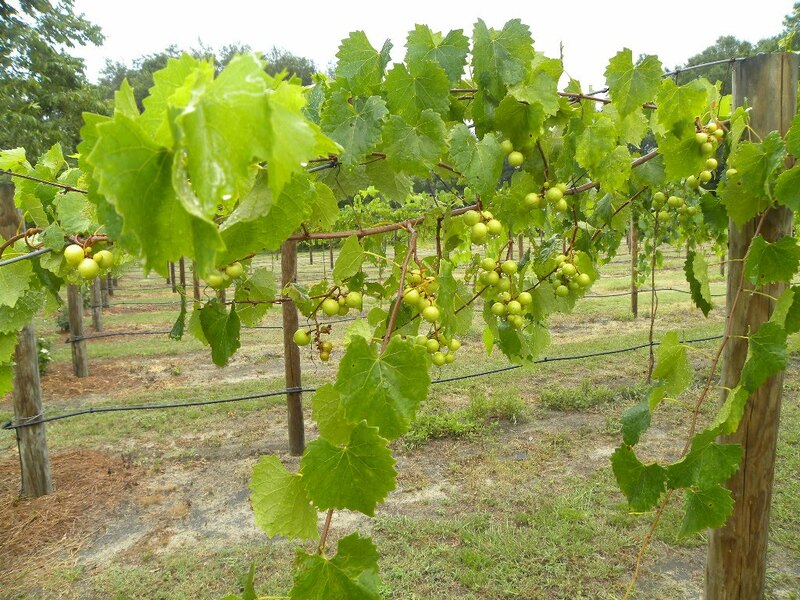 But their best sellers are the 100% muscadines, the Carolina Wren Red Wine, Crescent Moon White Wine, Palmetto Red Wine, and Yellow Jasmine White Wine. These are all medal winners - the most recent Finger Lakes competition was very successful. These wines are quite good - the whites recommended with spicy foods; the reds, perhaps for sipping. The reds reminded me of the Hungarian wine tradition of drinking semi-sweet reds; not overly sweet and very drinkable. 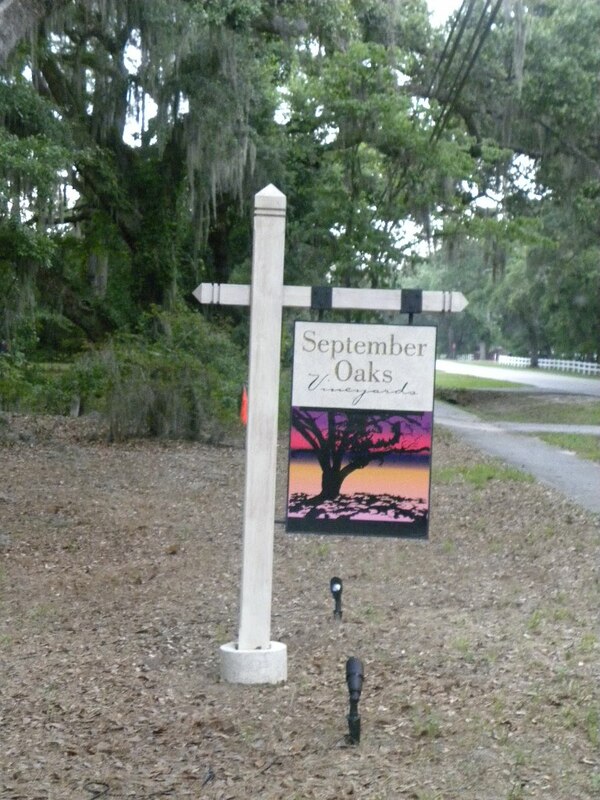 One day soon we need to visit Hilton Head which will allow us to visit September Oaks again as well as the other area wineries. 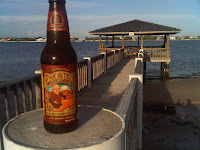 On the heels of enjoying a couple Holy Mackerel beers from Gordash Brewing Company on the 4th, we tried another Belgium styled beer from yet another Florida brewery, Monk In the Trunk from the Inlet Brewing Company. This is another fine ale - this time made with organic ingredients. It has all the characteristics expected in a Belgium ale: spice, fruit apricots in this one, and balanced throughout. Nicely done. 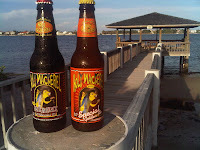 We found some excellent beers for the 4th from another Florida craft brewer; Holy Mackerel from Gordash Brewing Company. 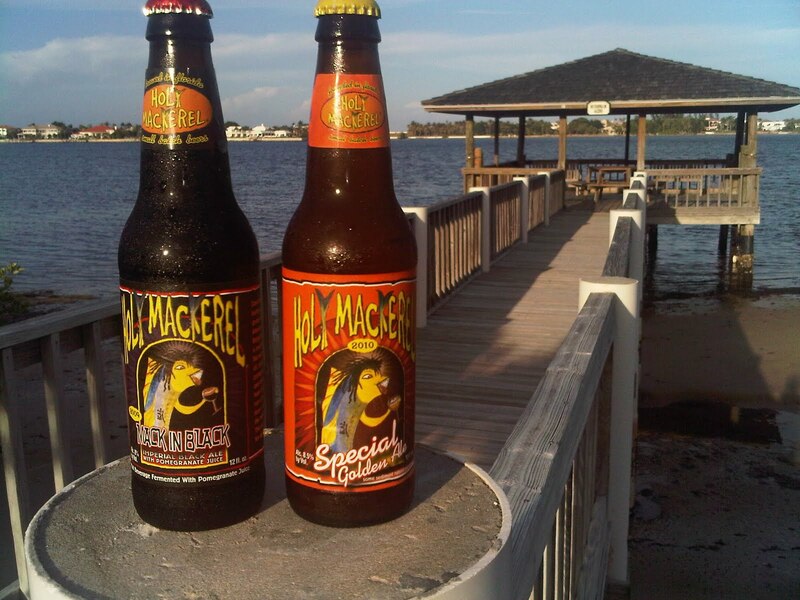 The brewery crafts three beers and we got our hands on two: Mack In Black and Special Golden Ale. The Mack in Black made from "dark chocolate barley and roasted grains paired with American hops, and Belgian yeast". This is a real interesting beer - its bolder than a traditional Black Lager, smoother than most Stouts, and with some of the chocolate characteristics of a Porter. Its not overly hoppy so the finish is very smooth and has a more chocolate character than espresso or coffee. A nice beer, but was completely overshadowed by the Special Golden Ale. This is a traditional Belgium styled ale made from Pilsner malt, Saaz Hops and Belgian Trappist yeast and bottled unfiltered and unpasturized. It has a full flavor with a hint of spice - balanced between hops and malt. 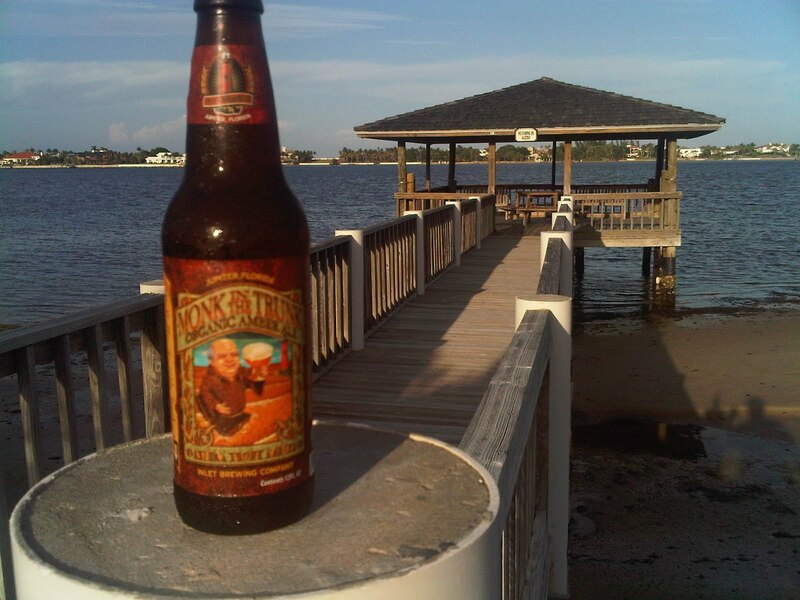 A great beer - and perfect for a hot Florida afternoon. And why not - after a little research we learned that Robert K. Gordash had entered an Extra Special Bitter into the Samuel Adams World Homebrew Contest and was one of three selected winners. Ten years later the Holy Mackerel brand of beers was born.